Believe it or not this is the site where the Mater Hospital Nurses Home once stood. Do you remember the tall red brick building facing onto the North Circular Road directly across from Mountjoy Garda station? Well now it’s gone, demolished and is being replaced by a more modern building. I’m not sure what this new building will be used for. 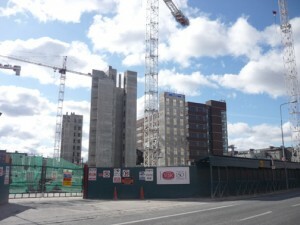 Another part of old Dublin bites the dust.